1980 found Frank Zappa at an interesting point. He had not released a single record that year, having released five (yes FIVE) records in 1979, including the triomphant "Joe's Garage, Acts I, II & III". A tour of the USA and Europe for March through July of that year had been booked, though with a smaller band than usual, including Arthur Barrow on bass, Ike Willis on guitar and vocals, Ray White on guitar and vocals, and Tommy Mars on keys. Vinnie Colaiuta, Zappa's most recent (and perhaps greatest) drummer,- had reportedly attempted to squeeze a raise out of Frank (a big no-no), and as a result was replaced at the last minute by David Logeman, a Berklee graduate who beat out 54 candidates for the gig, and did an admirable job considering the impossible shoes he had to fill. The repertoire consisted largely of tunes that would comprise the "You Are What You Is" album, which would be recorded back in Los Angeles after the tour's conclusion (featuring "Sirat Abuse" by newcomer Steve Vai, who was not yet a part of the band during this tour). 11 songs in total were performed from that as-yet unrecorded LP, accompanied by a generous helping of "Joe's garage" tracks (which did much to highlight Colaiuta's absence) as well as some Zappa staples. The gig at the Ahoy in Rotterdam was only the second gig of the European leg of the tour, followinll approximately 36 dates throughout the States. In "The Real Frank Zappa Book", Frank described the Ahoy as "a charming sort of Dutch indoor bicycle racing grena with a concrete floor and a bankod wooden track all around the room." The show itself was typical of the tour: opening with a heavy guitar number, in this case "Chunga's Revenge" (which alternated the opening slot with "Watermelon In Easter Hay" and "Treacherous Cretins"), then launching into a couple tracks from "Joe's Garage": "Keep lt Greasy" and a gorgeous "Outside Now". Soon after, the band launches into a massive suite of tracks from the future "You Are What You Is", before heading back in time to "Cosmik Debris", then even farther back with "You Didn't Try To Call Me" and "I Ain't Got No Heart", concluding the trip down memory lane with the doo-wop track "Love of My Life" from "Cruising With Ruben and the Jets". The rest of the gig would rely on relatively current tracks, including pre-release versions of what would be the title track from the new record, as well as "I Dont Wanna Get Drafted", followed by more from "Joe's Garage" and "Sheik Yerbouti". "The Illinois Enema Bandit" ended the show, sung, as it always should be, by the incomparable Ray White. Having been broadcast by Dutch radio, this show was soon widely circulated on bootleg, including "Personality" on LP, and "Boot the Beats", a copy of that LP on CD, however both of these releases were in mono. A better, stereo source surfaced in the 90's, released by Take lt Or Leave lt Music as "Ahoy Rotterdam — June 24, 1980" (the date is incorrect). What you have before you now is the definitive version of this show, from two sources seamlessly edited together to present the music as it should be, devoid of DJ interruptions, radio bumpers, or tape flips. 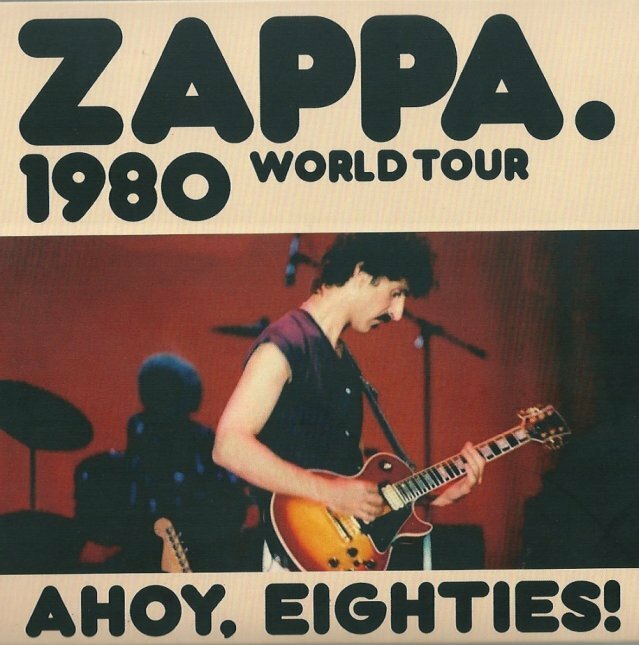 Enjoy this glimpse into Zappa's past as he looked into the future, towards what would be perhaps his most important decade for changing the world: the 1980s. 07. Why Does lt Hurt When I Pee? Ahoy, Eighties 0 out of 5 based on 0 ratings. 0 user reviews.